Press Information Monday, March 13th, 2017, 11:00am CET. A year after its long-awaited and hugely successful return to Honda’s motorcycle line-up, the Africa Twin has reached new heights by breaking the record for the highest altitude reached by a twin-cylinder motorcycle. 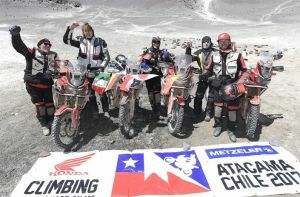 Scene of the record was the world’s highest active volcano, the Nevado Ojos del Salado - situated between Argentina and Chile - up whose slopes a team of five riders piloted the Africa Twin to a record-breaking 5,965 metres above sea level. Fabio Mossini, enduro champion from Honda’s Sud America race team was the man chosen to reach the new landmark, before further progress was halted by 2 metres of snow. After five days of acclimatisation, and riding standard Africa Twins specially equipped with Termignoni exhaust, revised final sprockets, new Metzeler MC360TM tyres and a range of Honda genuine accessories, the international team completed their ascent within 24 hours. Their route took them - in temperatures as low as minus 5 degrees Celsius - through broken asphalt, gravel, mud, sand and finally stretches of ice pockets known as ‘penitentes’, underlining once again the Africa Twin’s credentials as the best-performing off-road motorcycle in its class.